Johann Jakob Brucker came from a poor, pious family originally from Alsace. In 1715 he began studies in Jena. After various attempts, from 1720 onwards, to acquire a church post, he started making a living as private teacher. In 1724 he became headmaster of the latin school in Kaufbeuren (Allgäu), where he also served as a preacher. Brucker was plagued by hypochondria and a certain “Bangigkeit des Gemüts” (“anxiety of the heart/soul”), which he hoped could serve as a means to direct his mind towards other things. In 1723 he published his “Historia philosophica doctrinae de ideis”, which became very successful. The publication of an introduction into the history of philosophy for schools, “Kurze(n) Fragen aus der Philosophischen Historie” (1731-37, 12 volumes, Ulm; a one-volume extract “Auszug aus den Kurtzen Fragen aus der Philosophiehistorie etc.” appeard in 1736) earned him membership of the Berlin Academy. Memberships in various learned societies in Leipzig, Jena, Göttingen, Bologna, Munich, Duisburg and Rovereto followed. Developing his “Historia” further, and translating it into Latin, he finally published his “Historia Critica Philosophiae etc.” (5 volumes, 1742-44; the second imprint of 1766-67 has a further volume with supplements; it is available in reprint Hildesheim/New-York 1975). Friedrich II of Prussia wanted to appoint him as a preacher and theologian to the university of Halle, but Brucker declined, saying to a visitor that he was “just a poor worm and nothing else”, whose achievements became possible only through the grace of God. 1744 Brucker became pastor of the protestant parish of the Holy Cross in Augsburg. In 1747 publication of “Institutiones historiae philosophicae etc.” (second imprint 1756, third imprint 1790, revised by F.G. Born and supplemented by entries on Hume, Swedenborg, Baumgarten and especially Kant). “Erste Anfangsgründe der Philosophischen Geschichte” (2nd imprint Ulm 1751) is again directed at a wider audience. In addition to his works on the history of philosophy, Brucker also composed various theological works. His last great work, a bible commentary in 19 volumes, was never completed. In 1770, Johann Jackob Brucker fell from his library ladder, wanting to take out a book from higher shelves. He died from the consequences of his fall. According to Franz Wimmer, Brucker’s influence in the 18th and 19th centuries can hardly be over-estimated, even though his works are hardly known today. 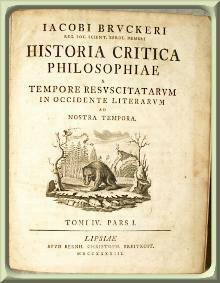 Especially his “Historia Critica” served as a reference work for a long period of time. Sources: Franz Wimmer, “Interkulturelle Philosophie. Geschichte und Theorie. Band I” Wien 1990: Passagen Verlag, p. 223f.